Joint Committee on Human Rights report on Counter-Extremism. To see their discussion about the problems with defining extremism please see pp.24-26. If you have been approached by a PREVENT officer or feel that you will be referred to one based on questions asked by your teacher / lecturer/ GP / social worker etc contact us for advice and support. We have Advocates who can support people who have been targeted by PREVENT. We can help you respond to their Islamophobic questions, explain your rights and explore options to challenge them if they try to refer you to Channel. 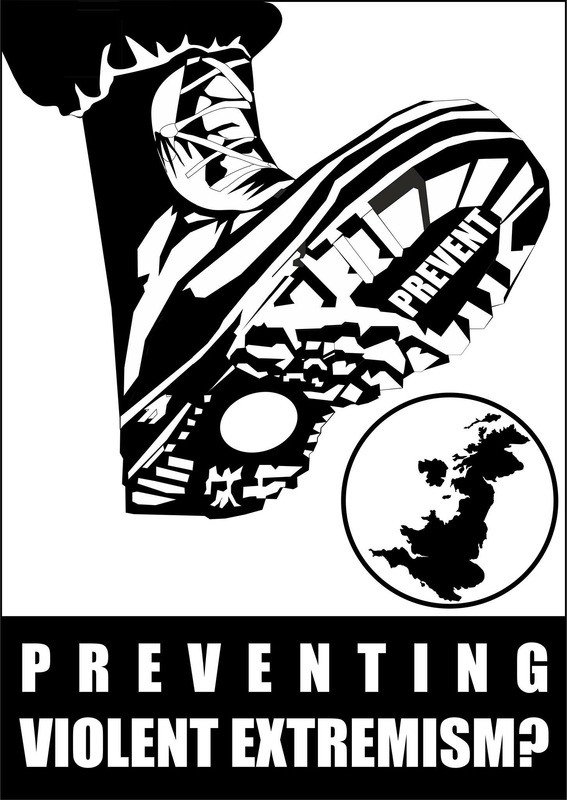 We offer training to groups / organisations to raise awareness about PREVENT with a view to empowering individuals / communities to challenge PREVENT. We can signpost you to a law firm to challenge PREVENT. If you would like advice, support or more information please contact us on 020 8904 4222 or info@ihrc.org. Preventing Education: Human Rights and UK Counter-Terrorism Policy in Schools – Rights Watch UK. The report brings to light a number of case studies never before reported and uncovers a range of human rights violations perpetrated against children in the United Kingdom in the name of national security. The central problem with this ‘battle of minds’ strategy is that, despite all its efforts to map and survey Muslims in Britain, it ends up creating a false image of Britain’s Muslim citizens.The dichotomy between ‘moderate’ and ‘extremist’ does not correspond to the ways in which Muslims actually live their lives and the extent to which ordinary Muslims are caught up in an ideological struggle between competing versions of Islam is hugely overstated.An al Qaida-type ideology does not constitute a viable alternative belief system for all but a tiny number of individuals in Britain.To believe otherwise is to conceive of Muslims as living in a moral universe that is separate from the rest of the population. Not only is this inaccurate but it also stigmatises Muslims as morally retrograde. Combining its new counter-terrorism powers and the Channel project, the government would have a set of powers that could be used to prevent certain opinions from being expressed, without the need for scrutiny of those powers in a criminal court. Together with the criminalisation of the ownership of books and strongly worded social media comments, the government is in danger of generating a mood of political self-censorship among Muslims that would be both counter-productive and damaging to democracy. The document relates to the government’s Prevent counter-extremism strategy, which requires schools to protect children from being drawn into all strands of radicalised ideas, including from the far-right. Each of the schools’ assessments say that white pupils are at low risk of radicalisation on account of their skin colour and because many families have links to the Armed Forces. A critical analysis of the Prevent counter-radicalisation model implemented in primary schools. The sophisticated analysis, based on hundreds of case studies by the security service, says there is no single pathway to violent extremism. Far from being religious zealots, a large number of those involved in terrorism do not practise their faith regularly. Many lack religious literacy and could actually be regarded as religious novices. Very few have been brought up in strongly religious households, and there is a higher than average proportion of converts. Some are involved in drug-taking, drinking alcohol and visiting prostitutes. MI5 says there is evidence that a well-established religious identity actually protects against violent radicalisation. Education, it seems, has become the latest battleground in the government’s relentless attempts to shape a brand of Islam it deems acceptable in modern Britain – liberal, secular and above all state-friendly. It is unacceptable that any of these views should be linked to extremism as a matter of government policy, and outrageous that it should be done as part of a document that has statutory force. It is no business of the Government, or of universities or the NHS, to prescribe the political perspective that anti-war campaigners may hold. The Russian writer Masha Gessen argues there no such thing as radicalisation, and that terrorism scholars say that radicalism is NOT a predictor of terrorism. She argues that social and political causes appear to be the main drivers, which clearly undermines the ‘conveyor belt’ theory that most flawed policy is built upon, and is an inconvenient truth for those who prefer to deflect attention away from the real drivers. This article will provide a critique of the PVE initiative and its implementation within the context of primary education following the events of 9/11, the 2001 riots and 7/7. Drawing upon empirical data I will argue that the monitoring of young Muslims and ‘extremism’ is problematic and reinforces the logics of Islamophobia through practices of governmentality. Moreover I will examine how whilst the monitoring of extremism is prioritized in many schools, training for teachers on race equality, tolerance and accepting difference is weak if not absent. This, I suggest, demonstrates a clear manifestation of contemporary hegemonic post-racial politics which increasingly silences the critique of institu- tional racism. Additionally this article will explore how Muslims in the sphere of education have been implicated and problematised against the backdrop of a ‘muscular liberalism’ intent on the return of assimilation- ist discourses. Learning together to be safe – Government guidance on signs of extremism includes: If you want some street cred, if you fight with your family or if you’re a bit of a rebel.